Ten miles up the road is Ludlow, once described by Sir John Betjeman as ‘probably the loveliest town in England’. Ludlow certainly has a lot going for it, with a highly successful annual food and drink festival, and more Michelin stars per head of population than any other place in Britain. The arrival of Tesco some years ago caused a major controversy, won in the end by the promise of jobs, but somehow Ludlow has survived. One thing that must have helped is that Tesco built on the site of the former livestock market in the town centre, not out-of-town. Another reason is - quite simply - Ludlow has always been more prosperous than Leominster. Its residents can afford to buy their bread at artisan bakers, their regional cheese and locally-produced meat at any number of well-stocked delis, and English wine from local organic vineyards. In fact Ludlow is a ‘Slow Town’, the first in the UK to join the Italian Cittaslow movement. ‘Slow’ of course means the opposite of ‘fast’. If fast food is homogenised rubbish, then Slow food celebrates local traditions and diversity. Instead of a world where everything is the same everywhere, Slow stands up for the handmade, the regional, the authentic, the sustainable. It means knowing where produce comes from, and no surprise horse meat!. Slow means co-operation, not competition. If you think Slow means slow-witted, think again. 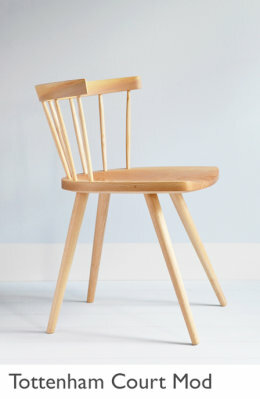 In this sense the Bodging Project / Bodging Milano can be thought of as Slow, and what we’ve been making are Slow Chairs. 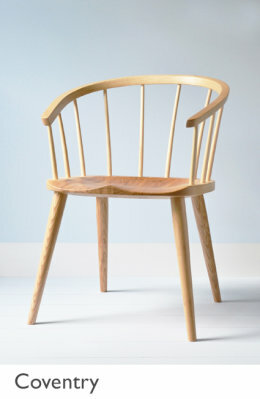 It’s not just the chairs we made in the woods that demonstrate this way of thinking. 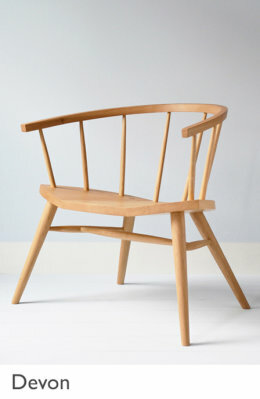 Recently I was looking at some chairs I’d designed that are in production at Dave Green’s company ‘Sitting Firm Chairmakers’, and commented on the attractive figuring of the Elm used for the seats. I was surprised to learn not only that the Elm was Scottish (apparently trees north of the border were not affected by Dutch Elm Disease) but that Dave could tell me the exact location of the plantation that had grown the timber. This to me was like looking at the label on an Appellation d'Origine Contrôlée wine or cheese, and discovering the exact plot of ground - the ‘terroir’ - that produced it. One problem for designers and makers is : are our activities contributing to waste and the consumption of non-renewable resources? After all, how many new chairs (or toasters, or cars, or anything else) does the world really need? A few days at the Milan Furniture Fair can cause - not exactly Stendhal’s Syndrome - but certainly a feeling of dizzying overload in the face of so many new products. Unlike some types of craft, design must move forward, it cannot stand still. I believe we can learn from the Slow Movement about which sorts of products deserve to make it into the market. There’s nothing more depressing than driving through a town on the day before ‘bin day’ and seeing piles of last year’s Ikea furniture awaiting collection. If consumers know more about the products they buy - who designed them, who made them, where the materials come, what the back-story is - they’ll have a much greater personal investment in the item and be much more likely to buy with the idea of the long-term in mind. Of course cost is a big factor, there is more chance of selling Slow furniture in a well-off place like Ludlow than there is in poor old Leominster. But if people bought less, bought local, and bought to last, the net expenditure might be about the same. The difference would be fewer container-ships on the high seas, less waste, and more jobs for local people. 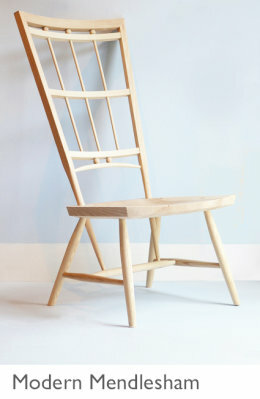 I currently have five Slow Chairs in production, made in collaboration with Sitting Firm Chairmakers. These are: Arden, Coventry, Devon, Modern Mendlesham, and Tottenham Court Mod. 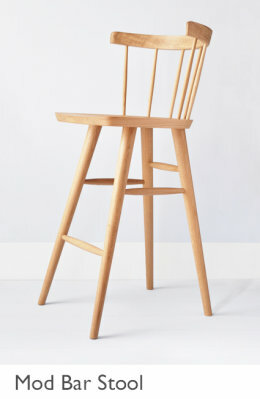 There is also a bar stool version of the Tottenham Court Mod. 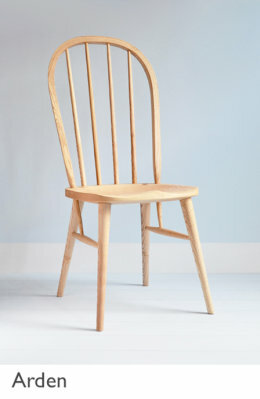 They can all be bought direct from this website (see 'ONLINE SHOP' in the menu on the left) and because they are made in the traditional way, individual preference as to timber variation and seat height is not a problem.